A branch line to St. Ives was to be included in the original plan for West Cornwall Railway in 1845 but was rejected. It was later authorised by Parliament in 1873 to run from St.Ives Road Station (later St. Erth) to Lelant, Carbis Bay and St. Ives. By this time the West Cornwall Railway was mixed gauge (the original standard gauge was retained and a third rail added for broad gauge trains, see On This Day 1 March 1867). 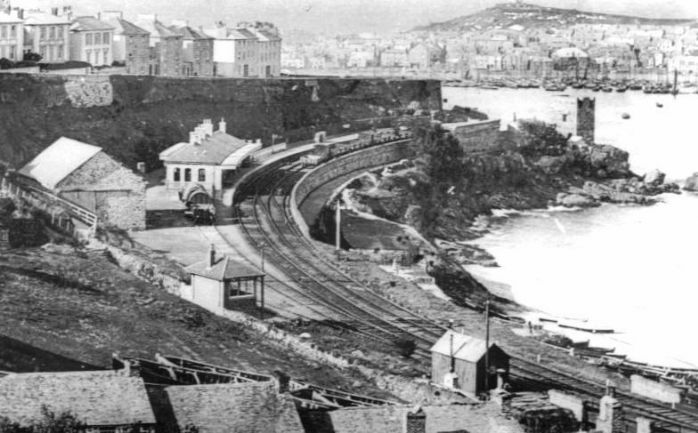 The St. Ives branch was almost completely broad gauge only excepting a mixed gauge section from St.Erth to Lelant and standard gauge only to Lelant Quay. The railway was a great success. Already tourists were coming to St. Ives. With the pilchard fishery and other fisheries St. Ives was a major fishing port and much of this fish was carried along the branch to London and other cities by the GWR and associated companies. Agricultural products, notably broccoli, were also carried. By 1890 the pilchard fishery had declined but the line carried increasing numbers of passengers and this was the pattern through the first half of the twentieth century. Through trains from London (Paddington) ran on the line on summer Saturdays. But the motor was having a great impact, especially from the 1960s onwards and passenger traffic was declining. 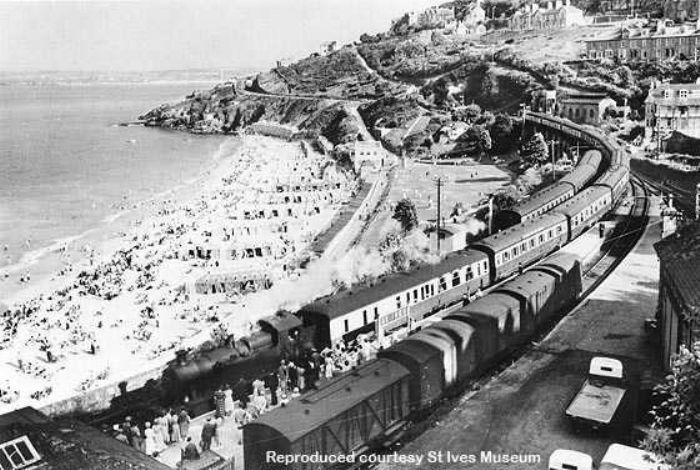 Dr. Beeching, in 1963, recommended closure but this was successfully resisted and today the line enjoys great success because of its scenic value and a park and ride scheme which enables motorists to avoid parking difficulties in St. Ives. This picture is part of the advertising for the St Ives Park & Ride scheme, it shows the wonderful views to be had from the train and the proximity of the railway to the sea.